We were having toast, and she had a jar of her mom’s pear ginger jam. I buttered my toast, spread a liberal dollop of jam over it, and bit in. It was pure toast perfection: tart ginger with sweet and soft autumn pears, mingling with melting butter. I knew I could happily eat this for breakfast for the rest of my days. Her mother, Mrs. Doucet, shared the recipe with me and now I can have toast perfection any morning I like over here on the other side of the country. 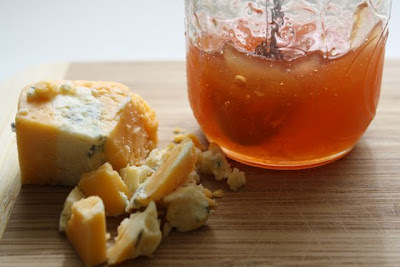 I’ve also discovered that pear ginger jam is a perfect accompaniment for a sharp cheese. In this case, a blue cheddar that my mom brought up from the Okanagan. Dinner was cooking – and taking way too long – but we were happy to nibble on crackers, cheese and jam, and sip our Okanagan wine while we waited. I warn you, though, you might just want to eat this for your whole dinner. Breakfast or dinner, pear ginger jam will see you through. Add ginger and rest of sugar and bring to a boil. Leave uncovered and stir frequently until it’s thick and the pears are clear (about 1 hour). Ladle into sterilized jars, seal and can for 10 minutes in boiling water. 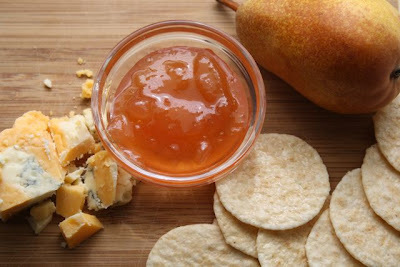 Serve with toast and butter for breakfast, or with crackers and sharp cheese before dinner. I made this delicous jam last night, it's been all packaged to give as Christmas gifts but I kept a big jar to myself! yummy! Thanks for the great recipe!